Note: In the Datasheet below there is a pin layout listed as "Bottom View." Be aware, this pin layout is actually the top-down view NOT bottom-up. When the relay is off, the COM (common) pin will be connected to the NC (Normally Closed) pin. When the relay is on, the COM pin will be connected to the NO (Normally Open) pin. For a more detailed description about the pin layout and application circuit, check out the SIK Guide in Circuit 13: Relays (pg. 71) or our online SIK Guide v3.3 [ Experiment 13: Using Relays ]. Eagle Part is under the SparkFun-Electromechanical.lbr > Relay SPDT - relay (COM-00101) . The Device is "RELAYPTH4" under the package RELAY-JZC . Any plans to get 3V DC coil relays, like the G6RL from the same company?
" itâs always a pain to interface with 5Vâ¦"
No, it isn't, all it requires is a transistor, which you'll need anyway at 3V: a microcontroller can't provide the required current, which at 3V is 70$ higher than at 5V. There's some confusion below and in the product images as to what the ACTUAL footprint of this part is. I've just ordered a few for a project (6/21/13) and here are my notes: 1) the datasheet linked above is correct, and the images correspond to the FOOTPRINT (view looking down THROUGH the part). 2) the FIRST image seems to be correct, and of the part shipped (JZC-11F 005-1Z). 3) In the Sparkfun eagle library at https://github.com/sparkfun/SparkFun-Eagle-Libraries, the part is RELAYPTH4, with the RELAY-JZC package (Notably NOT the "SPDT relay (COM-00100)", which is quite misleading. tl;dr: part-footprint-shipped matching is confusing, the part I received on 6/21/13 matches RELAYPTH4 in the library. Does anyone know which relay matches the footprint in the eagle library? I ordered my PCBs using the sparkfun eagle library assuming that the referenced part number would match. I've learned a valuable lesson but I need to salvage the situation! Which relay would match the footprint? Thanks! I found that the Omron G5V-1 matches the COM-00100 footprint, and is available online from other suppliers. 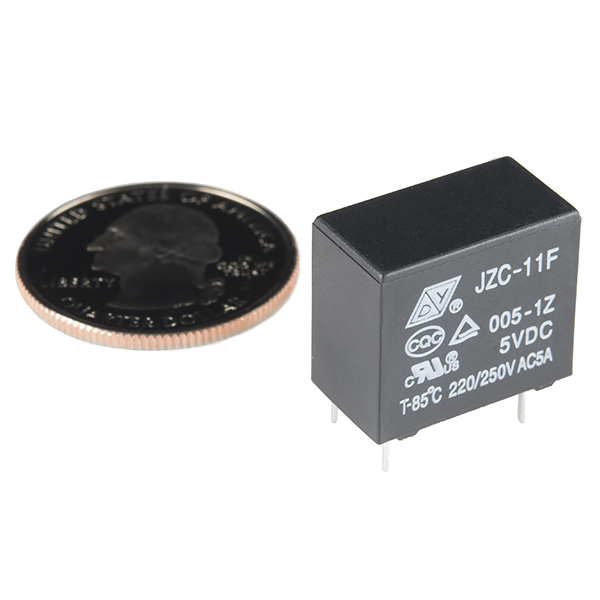 Note that it is a "small signal" relay instead of a "power" relay, and as such is only rated for 0.5A at 125VAC or 1A at 24VDC. Fortunately, this was just enough for my purposes, so I was able to use my PCBs without major hackery. I can confirm this relay works driven directly from a 5V Arduino digital output. However, it shouldn't, given that the Arduino Uno max current per pin is 40mA. 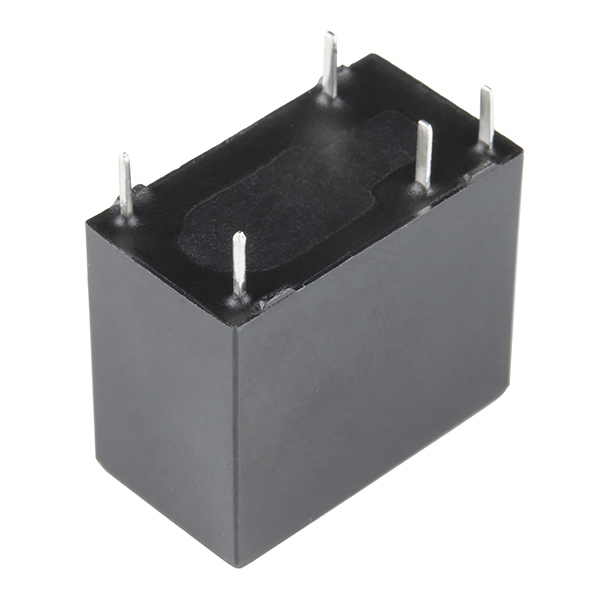 According to the relay's actual datasheet, the coil dissipation is 0.72W and has a resistance of 35 ohms. In theory at 5V it should require 143mA, right? But it works. Update: that datasheet link now gone, this is the URL now, but it still has incorrect photo. vince086: Since this relay has 2 connection possibility is the connection determined by the polarity of the current going to the coil? or is one of the connections nc and the other no until current is applied ? One of the contacts is normally closed and the other normally open. The contacts switch when current flows through the coil. Can u use this on a breadboard? My relay is drawing 95mA @ 5V. I measured the coil resistance and it is 52Ohms instead of the 320Ohms (with 10% error) specified by the data sheet. This makes it unusable for my application. Did I just get a bad part or is the data sheet incorrect? 95mA at 5V is about 400mW, which is a common power for a "normal" relay. High sensitivity relays consume less power (250-300mW), but usually can switch less power as well. You don't have a bad part, it's the datasheet which is incorrect: it's for the 12V version instead of the 5V version. About being usable: have you considered a transistor to switch the relay? No microcontroller can directly control a 5V relay due to the high current required. Any chance you could provide me with a Digikey equivalent part (one with the same footprint)? I love ordering from SparkFun for prototyping but I can't seem to find this relay on Digikey. C'mon, y'all. Can you not get a decent datasheet after all of these years? Love this little guy, works great. However, what on earth should I enclose it with? Is there any kind of socket or holder for this form factor? I would like to flip household (110V) switches with this, using an Arduino Uno (5V). Am I safe to do so, juicing the coil with a 2N3904 transistor? Or do I need a 2222, or even more? I got these in the mail and a 2N3904 to feed it 9v works perfectly. It seems to also work straight off the 5v arduino uno, but probably better to use the transistor and be on the safe side. This is just an ok relay. The coil resistance is 60 ohms so it is not technically Arduino safe (83mA). The voltage drops when the relay is on and screws up my analog readings. The leads are kind of flimsy as well and don't stick in a breadboard. I like the Omron that SparkFun carried before better. Has anyone used this relay in a near space balloon project? My concern is the cold temperatures, will relays work at high attitudes? Any comments are appreciated. Can I triger it with a lilypad? I'm trying to use it to triger some 12v solenoids. Is there some kind of break out board for this, was hoping it would fit on a bread board but the pins don't quite make it. So an adapter is going to be needed. If any one knows of one, that would be great. Well no matter what, you won't be able to drive a relay coil directly from an MCU. BUT, it definitely is convenient to not require a second power supply! So here's part at mouser I'm looking at. The 3V version Need 60mA to trigger the coil, but with a diode protected transistor buffer, it should work OK with a 2 or 3 cell supply. Reading the datasheet, it says the max operating time is 20mSec. This seems odd for it to not be able to operate something for very long, am I not understanding correctly? I plan to run 12 volts through this thing for up to a minute at a time, but if I can't, then I'd rather find another option. Yes this will absolutely work. I think no. Is it 7.2V DC? 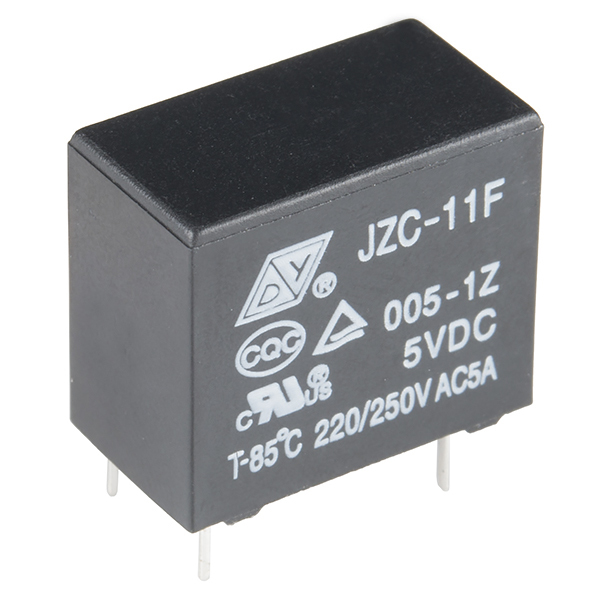 These relays are meant for using a DC power to essentially act as a switch for AC power. you're looking for a transistor, which allows you to use a lower dc voltage in order to "switch on" a higher dc voltage. I can't guarantee that it will be the same for you. My advice: buy the relay before you order your PCB. That way, you can print out a copy of the board and poke the relay pins through the footprint you chose. That way, you can verify that you are using the right footprint. I ordered this but received an omron g5sb14, which is actually a better relay, so pretty happy with the mixup. So I can connect 110v house power to the poles on this little thing?? Any suggestions for connectors, as the pins on this thing are tiny and standard home wiring isn't. I've also been having some trouble with the Eagle library - none of the pinouts or footprints in the library match what I received in my order. Yup, I had to modify the RELAYPTH part after I received the relays an saw the actual pin arrangement. If anyone at SparkFun is interested, I can email you the corrected layout for your library. The latest update of the Spark Library I have is from 13 April 2010. Or maybe there is a newer release that includes Wesley's update? email us at techsupport@sparkfun.com and we can get this fixed. thanks! I've ordered a couple of these for switching equipment with a 5V MCU, and I see now that the data sheet says the "Pick up voltage" is 9VDC - can anyone confirm that these will switch on 5VDC? Also, the datasheet's pinout is different from what appears in the SparkFun Eagle library as COM-00100 (RELAY-2G5Q). You need to use RELAYPTH instead. Since this relay has 2 connection possibility is the connection determined by the polarity of the current going to the coil? or is one of the connections nc and the other no until current is applied ? I may be wrong since I've never used relays before, but if you look at the datasheet the amperage required to turn on the relay goes up with lower voltage. for 5v the current is 80ma and would be likely as much as 100ma for a 3.3v relay. That much current will fry most any microcontroller pins, especially low power 3.3v devices. You need to use a transistor or mosfet to source enough current. The voltage on the relay input is then pretty immaterial. I have this working with my LilyPad Arduino, which runs around 3V. As the controllable mains tutorial says, though, you can't (at least with a LilyPad) control it directly off a microcontroller pin (though happily it didn't fry mine trying; just didn't switch). Instead, use a transistor to switch the + supply. I used them for a project I was making with a Raspberry Pi. They worked great. They do not fit tight onto bread board, so I held them in place and used a little hotglue to hold them tight to the bread board. The the pinout is not on 0.1" centers - even though the DS shows multiple of 2.54mm which should be 0.1"
The NC Pin is the worst of the error. I bought 3 - all the same way. Barely works on a protoboard, but on a breadboard the relay just wants to pop out.